Putting Fear In Your Ears: What Makes Music Sound Scary : Shots - Health News Young animals' cries for help and the soundtracks of spine-tingling movies have something in common: An irregular, scratchy sound signals that something scary is afoot. 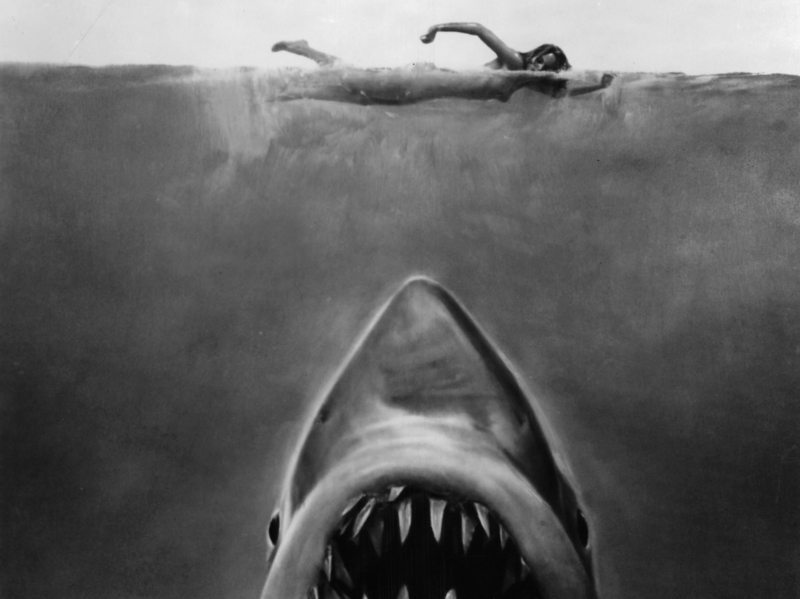 Susan Backlinie swims as the great white shark rises toward her in publicity art for the 1975 film Jaws. DUH-duh ... DUH-duh ... DUH-duh! Like those ominous bars of music signaling the approaching shark in Jaws, some of the most recognizable film scores were designed to terrify us. But how do our brains recognize that music is supposed to be scary? The answer lies in our animal instincts, says UCLA evolutionary biologist Daniel Blumstein, whose research is published in the latest issue of the journal Biology Letters. Blumstein's study of human sound perception began in an unlikely place: a community of yellow-bellied marmots in Colorado. "The thing that struck me was that every once in a while when we catch a baby marmot, they scream," Blumstein said. 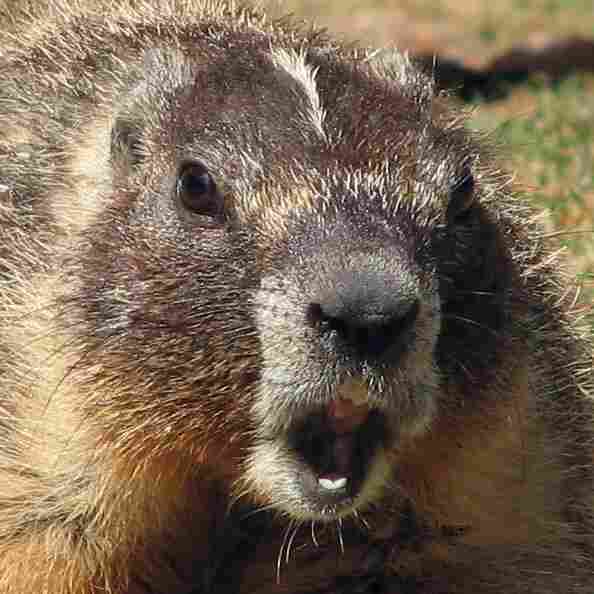 Screams, like those of the baby marmot, are created when animals hurriedly blow air past their vocal cords, releasing an irregular scratchy noise called nonlinear sound. Nonlinear noises, used by young animals to grab the attention of their parents, seem to also evoke an emotional response in humans. "Clearly, people in Hollywood know this, but it's not as though they're going out and using biologically tested algorithms," Blumstein said. So Blumstein and his colleagues set out to discover if there truly was a formula for fear involving nonlinear sound. He teamed up with film score composer Peter Kaye and communications professor Greg Bryant to create two groups of original music: a group of emotionally neutral scores and scores that incorporated nonlinear elements. Can You Hear The Fear? In one study, a score with irregular noises elicited plenty of emotional stimulation and negative feelings. Subjects were asked to listen to a random mixture of the two groups and rate them based on emotional stimulation, and the type of emotion they evoked. The results of the study confirmed Blumstein's prediction. The musical pieces containing nonlinear elements elicited the highest level of emotional stimulation, as well as the most negative feeling. In a second experiment, volunteers were asked to listen to and rate the same music while watching neutral videos that showed someone drinking coffee or turning the page of a book. When paired with the boring videos, the nonlinear music didn't evoke the same level of emotion. "I think in this case there is a visual dominance," Blumstein said. "Here we find that when you put the two [video and audio] together, you lose the acoustic affect you had before." Blumstein believes that the work represents more than just an interesting exploration of how we process sensory information. "Maybe we'll be able to come up with better biologically inspired sounds," Blumstein said. "How do you make an abrasive alarm? How do you make things that are hard to ignore?" So when you curse the beeping of your alarm clock tomorrow morning, know that you might just be responding to your deepest animal instincts. "Everyone should listen to their inner marmot," Blumstein said.